ATLANTA — If you’re a racing fan, you’re more than likely familiar with such history makers as Willy T. Ribbs, Wendell Scott, Darrell ‘Bubba’ Wallace Jr., Latrice ‘Tia’ Norfleet and Lewis Hamilton. As Black History Month winds down and we gradually shift gears toward Women’s History Month, we are honored to have a two-part conversation with Melissa Harville-Lebron. Unlike the previously noted names, barrier breaker Harville-Lebron has not spent countless hours on the track behind the wheel, racking up laps. She’s literally taken a different course of action to steer the wheel and break into this male-dominated sport, which lacks diversity in terms of both melanin and gender. This mother of seven joins the ranks of a highly exclusive club, becoming one of two Black women to enter the sisterhood of actually owning a NASCAR team. The first was Dr. Jennifer Satterfield-Siegel, who is married to Max Siegel. 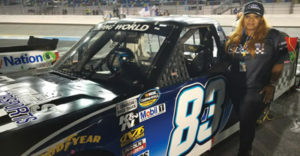 The married couple has fielded cars for such drivers as Darrell ‘Bubba’ Wallace Jr. The effervescent Harville-Lebron is making her mark in NASCAR as a team owner while fielding a Black and Hispanic driving team. That’s a remarkable feat in and of itself. Growing up, the native New Yorker was not immersed in racing culture. In fact, like Eva Gabor, who played Lisa in the 1960s sitcom Green Acres (which still airs today), she was more accustomed to the big city life compared to spending time at the tracks (or in the case of Lisa on the farm). This new NASCAR pioneer life is centered around corporate America, music, fashion, ferries and the infamous New York subway system. In a candid, wide-ranging conversation, Lebron-Harville shares with us how a career in the music industry, a near death experience — where she was advised to get her financial house in order — and a gesture of love for two of her sons, reluctantly drove her to the high-stakes, money-draining pastime.